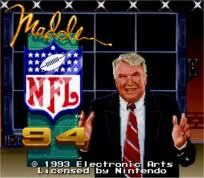 All games in tagged with "Madden NFL 94"
Madden NFL '94, released in Japan as NFL Pro Football '94 (not to be confused with Sega's NFL Football '94 Starring Joe Montana), is a football video game released in 1993. It was the first game in the Madden series with an official NFL team license, as well as the first Madden game that allowed players to play a full regular season (via a password system).It was the first Madden game to use the famous "EA Sports - It's in the Game" audio tag. It also introduced the "Flip play", "Play-call mode", "Pass-catch mode" and "Bluff play" options to the series. This was the first Madden title to pause the action and rotate the screen during punts, kickoffs and turnovers, rather than instantly reversing P.O.V. to the opposite side of the field, which could be disorienting to players. The field could also be rotated to view plays from any angle in instant replay.This was also the first of the Madden games to have Super Bowl teams available for play without any special codes.Due to an error, the entire rosters for the New York Giants and New York Jets were reversed. For example, the quarterback for the Jets was #11 (Phil Simms of the Giants) while the quarterback for the Giants was #7 (Boomer Esiason of the Jets). This error affected at least the copies for SNES available during the Christmas shopping season of 1993.Certain versions of the game were labeled as "Limited First Round Editions".